1. Faith teaches us that the soul which is in the state of grace and has expiated all the temporal punishments due to its sins, goes immediately to Heaven when it is separated from the body. There the soul enjoys eternal happiness. It sees God face to face. It sees Him without any intervention of created things, but as He is in Himself in the Unity of Trinity of His infinite perfections. In this beatific vision the intellect remains completely satisfied, because in God there is every truth, beauty and goodness. The will abandons itself entirely to the will of God, desiring nothing else and loving nothing else but God alone. There springs from this abandonment a love which satisfies every desire, an inexpressible joy and a boundless peace. The happy soul will see the Blessed Virgin, too, and she will smile upon it with maternal tenderness. It will see the Angels and Saints gathered around the King of Kings and the Queen of Heaven, singing their praises. St. Paul, who was taken up to the third Heaven, tells us that it is impossible to imagine or to describe the unknown joys which are experienced there. In comparison with the eternal happiness of Heaven, the poor pleasures of this world are empty shadows. We cannot imagine the happiness of those who have gained Heaven by their good lives upon earth. 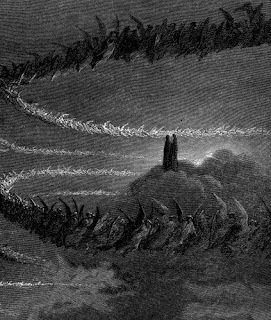 The concept of Heaven is so beautiful and immense that it caused the Saints to desire death as a means of going there. They welcomed suffering, too, because it brought them nearer to their goal. 2. Our souls have an innate desire to be ahppy. God Himself has placed this desire in our hearts. What else are we doing all our lives but trying by every possible means to be happy? Unfortunately, we seek happiness where it is not to be found. Some seek it in material gain, others in honours, others in pleasure. But our hearts are much wider than the riches and honours and pleasures of this world. In comparison with the riches of the human spirit, worldly wealth is a very insignificant thing. Worldly honours are shadows which pass. As the "Imitation of Christ" reminds us, we are what we are before God, not what we appear before men (Bk. III, Chapter 50:8). Pleasure also passes quickly, and when it is immoderate it leaves in our hearts a sense of emptiness and disgust. St. Augustine had a good deal of experience of the deceptiveness and complexity of human happiness. He had reason to exclaim: You have made us for Yourself, O Lord, and our hearts are restless except in You (Confessions, II, 2:4). We should follow the example of the Saints and aim at Heaven in everything we do. This should be the goal of our earthly journey. We should make sure that all our actions are in conformity with the will of God and directed towards this end. 3. God desires our salvation. God wishes all men to be saved (1 Tim. 2:4). We are all aspirants of Heaven. We shall not be denied the grace of God so long as we ask for it with confidence and perseverance. St. Augustine tells us that Paradise is ours if we wish: You are not called to embrace the earth, but to prepare yourselves for Heaven; not to be the successes of this world nor to a short-lived and transient prosperity, but to eternal life together with the Angels (Serm. 296, 6:7). Contemplate this true and everlasting happiness. Let us direct towards it our intentions and desires and all our work. Then the day will come when we shall be really happy for all eternity. In your charity, please say a prayer for me. Thank you.